Dora Bromme, a three-year resident of the Program in Community and Agroecology at UC Santa Cruz, right, discusses ways to work together with Nikki Fiore, a member of Students for Ongoing Solutions. 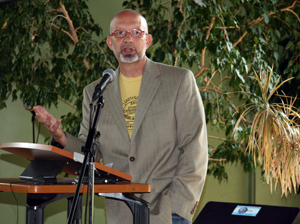 Fred Keeley delivers a keynote speech at the 10th Annual Campus Earth Summit. Instead of breaking into separate groups for drill-down topic conversations, this year's Campus Earth Summit participants kept the conversations going within the Colleges Nine and 10 multipurpose room. The result was "everyone had a chance to give input on all 10 topic areas," said Tyler Pitts, a 2010 graduate in environmental studies, who is working as a coordinator with the Student Environmental Center on the Blueprint for a Sustainable Campus. The all-student organized Earth Summit on April 22, now in its 10th year, brought together students, faculty, staff, and community members to share ideas and strategize on how to transform UCSC into a sustainable campus. One of those impromptu conversations came when Dora Bromme, a senior literature major, explained to Nikki Fiore how the Program in Community and Agroecology (PICA) works. Fiore, a second-year environmental studies and biology major at College 8, visited PICAs table from a table she staffed nearby for Students for Ongoing Solutions, a group that works to establish community gardens across campus. The result is a plan on how they can work together on an upcoming "green chef" competition patterned after Iron Chef of television fame – but sustainable. Visiting the Earth Summit on Earth Day this year was a contingent from the University of Hawaii's West Oahu campus. Joe Mobley, the interim vice chancellor for academic affairs, explained he and his colleagues are looking for sustainable ideas as they build out their campus. "I'm very impressed with what you guys are doing in Santa Cruz," Mobley said. Also staffing a table, Kimberly Keil-Naji, a Santa Cruz resident representing Office Max, handed out canvas bags, biodegradable pens and plantable bookmarks with wildflower seeds. "I love this program," she said of the Earth Summit. "I've watched it grow each year." Environmental Studies professor James Barsimantov distributed information seeking interns for IDEASS -- "Impact Designs: Engineering and Sustainability through Student Service." The program is designed to enhance science, technology, engineering, and mathematics skills and has weathered the tough first year of getting established. 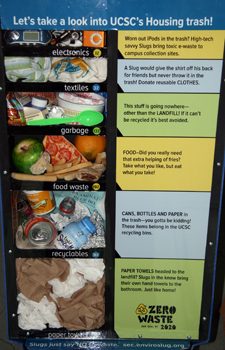 Information is available by clicking the IDEASS tab at sustainability.ucsc.edu. Deadline for applications is May 20. Keynote speaker Fred Keeley, former assemblymember, current Santa Cruz County treasurer, and longtime environmentalist, focused his remarks on the issue of global climate change. "No issue has moved from the fringes of public policy to the centerpiece of a national and international dialog" as quickly, he said. Keeley urged the summit's attendees to keep up their efforts and keep the conversations going. 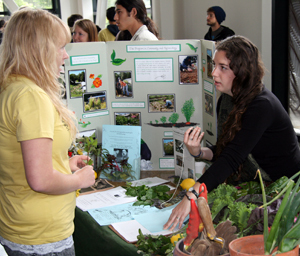 The Student Environmental Center hosted the 10th Annual Campus Earth Summit in partnership with Campus Sustainability Office, College 8 Programs, Colleges 9/10 and TAPS, UCSC Dining, Campus Sustainability Council, Education for a Sustainable Living Program, and the Foods Systems Working Group.